Buster Keaton didn’t direct this tight little story about rival steamboat families, but his character and many of the stunts are among his most memorable. Keaton always made good use of contrasting characters. Like Chaplin, he was a smaller man, and often chose very large men to play his nemesis. In Steamboat, he is played against his big, tough, boat-savvy father. Keaton plays a dainty dandy from Boston. This sets the stage for many classic scenes, like the purchasing of a hat, learning the mechanics of the boat, and learning how to fight. But the greatest impression is made by the phenomenal stunts in the final section of the film. Keaton took at least as many risks as martial arts expert Jackie Chan, jumping from high places, taking odd tumbles and getting knocked around by enemies. 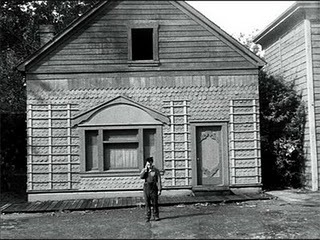 Steamboat features two of his best: Keaton stands erect, confused, as the entire side of a house falls on top of him. He barely fits through the open door as it passes over him. Earlier, Keaton is caught in a huge storm. High-powered winds pummel him as he jumps, tumbles and stands nearly horizontal to the ground in his attempt to walk forward. Like most amazing physical feats, one has to see it to fully appreciate it. Highly recommended for Keaton fans or anybody who likes physical comedy and impressive stunts. This entry was posted on February 20, 2010 by Ian Kay. It was filed under Steamboat Bill Jr. (1928) .